For the last few years, I’ve been participating in The 100 day project. A daily creative project that I’ve grown to love more with every passing year. I’m always telling myself I need to spend more time doing small creative things. I’ve been drawing since forever, and the 100 day project is a really good way to make a commitment to my practice. Do the thing, good things will happen! The first year I participated I used the project to teach myself lettering. It was awesome to watch my skill improve a little every day. That project was really impactful for me because once I finished it I had a body of work that allowed me to start my own store. Every year I have participated something awesome has come out of the project, whether it’s the work itself, or some new connection I didn’t have before. One of the equally great and horrible things about the 100 day project is the commitment. Showing up every day even when you don’t want to is a really great exercise. I found that no matter what mood I was in before I would do my daily drawing, by the time I had finished my mood would be considerably lifted. Having a creative outlet is super important to me, but I often will let it slip because, you know: life (or the new Mass Effect being released but whatevs). Making the commitment to show up every day helps make it a non-negotiable part of your day that you can plan around. One of the best things about this project for me hands down has been the awesome sense of community you can start building with the people around you. At Shopify, we have a 100 day project group where we share out work, talk about our projects, and get cool ideas from our peers. You can take a look at our collective works here. Throughout the project, I would spend a bit of time browsing through the 100 day project hashtag on Instagram. I found a bunch of cool people and made a bunch of new connections that I don’t think I would have made otherwise. So you should definitely do this project, right? If you want to join, check out The 100 day project publication, and follow Elle (the creator of this lovely project) on Instagram. She is also offering an awesome creative collective course throughout the project if you want some extra guidance + support from her! Since this is my third run through this project, I have a few tips that you can use to help get you started. Hopefully they can help you avoid some of the pitfalls I have fallen into multiple times now! Last year I made the mistake of taking a lot of my creature drawings too far. I forced myself to spend a lot more time and energy every day than I should have, and as a result I kind of burnt out near the end of my project. My advice: Pick something that you can do in less than 5 minutes, but could spend more if you want to or have the time. Your subject can be anything, from drawing or poetry, yoyo tricks to playing music. Let’s be real, no matter what you pick you’re gonna get tired of it in some way. If you have a theme that you can explore within, you’ll be less likely to want to gauge your eyeballs out with spoons :D As an example, last year my project was Creatures, so sometimes I designed my own, and sometimes I drew ones that already existed. My advice: pick a theme with enough wiggle room that you can explore within it. Picking a project that forces you to use a very specific tool (like you computer or a specific program) can lead to complications during the project. Life happens, and sometimes you won’t have access to what you ‘need’ to do your project if it requires a specific tool. My advice: Pick something that you can do in any place or situation, so that you’re setting yourself up for success. 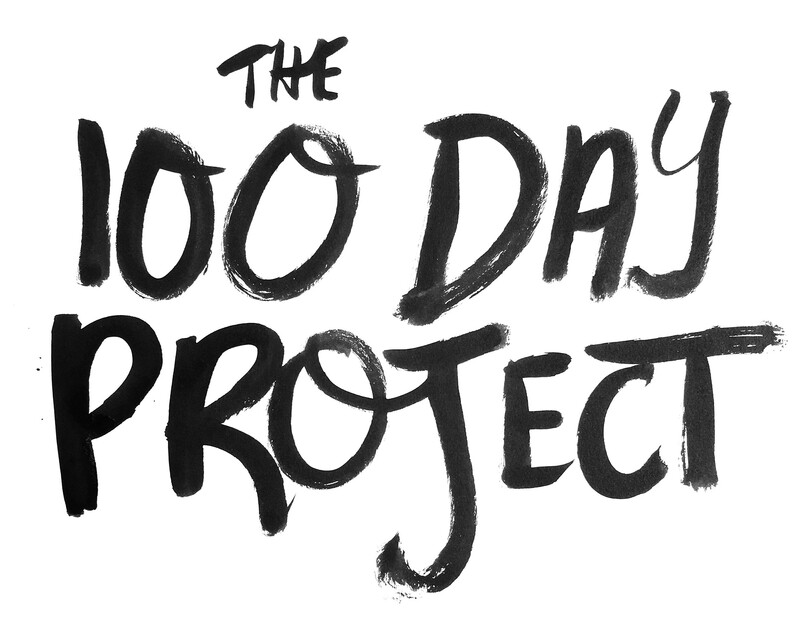 Go forth, join the 100 day project. Connect with me on Instagram and we can chat about it! Are you planning on joining the project? Let me know what you’re doing and drop a link to your Instagram (or wherever you are posting the project) so I can follow your work!